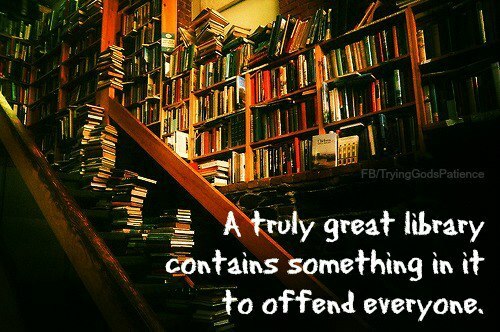 I must have a terrific library then, because of all the recent acquisitions that are offending me. It’s not the subject matter as such. I have an open mind, or so I like to think, but I don’t like sloppy thinking, handwavy reasoning, unsupported conclusions, and implausible situations. Give me an idea, even an unpalatable one, construct a rational argument for it, and I will cede that you have a point, even if it’s one I will never agree with. But cloak even the brightest thought in raggedy arguments, surround the most brilliant plot point with text that makes no sense, and I will regret spending the time, money, and resources to read it. As I stated in my New Year’s resolutions, I am not going to feel compelled to finish books like that. If the author has previously done a good job of entertaining me, I will forgive a book that just didn’t trip my trigger, put it aside, and wait for the next one. If, however, an author who previously told a sound story puts out a book that is sloppy, handwavy, unsupported, and implausible, I am going to feel betrayed. I don’t like “fated mates” stories generally. The whole idea skips too much important development. I’d kind of like to read a fated mate story where they hate each other for very good and valid reasons and have to work around it. Recs please, if you know of one. Usually it’s “Oooh! Mine!” and straight to bed. But if I run across something that slips fated mates in on me and makes it interesting, I’ll offer an extra round of applause even. But take a theme which could have a lot of interest to it, treat it cheaply, sensationally, and superficially, I am not going to get excited about it. At least not in any good way. Do this with several such ideas in one story, and I am likely to hold my head and weep, directly into the review. Taking some professional aspect and mutilate it in a way that it no longer resembles correct practice, even to the complete layperson because it runs completely counter to good sense, (ie cop handling bloody evidence at a crime scene with bare hands, scientist tasting unknown but probably toxic substances, handy guy fixing a large leak with nothing but a carving knife, because come on, even MacGyver needed a pack of chewing gum), or violates physical laws, and yeah, I will notice it out loud. And I won’t be happy. I've seen things recently that are the equivalent of having the character blow into the big end of the tuba and getting a sound like a flute. I'm with you. Sometimes you strain your eyes from the rolling. 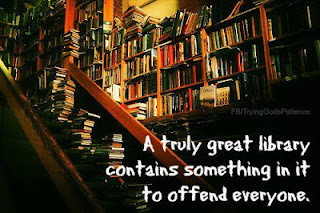 I know that it's fiction, and especially if I love the story or characters I can let a lot go, but somethings are just common sense, and to disregard that and assume a reader is willing to overlook some basic things is insulting in some ways. I will let some things slide, and I may not recognize others, but dammit, if someone gives me a police procedural, it should not go completely opposite of police procedure, or if it's science fiction, gravity should not disappear without a reason. And if it takes almost a full book of stupid to get to the part where oh yeah, there was a reason for this, well, sorry, I may never get past the stupid.